"Her greatest talent was for life"
Plot Summery: Iris tells the tender and extraordinary true story of the enduring love between the novelist and philosopher Iris Murdoch and her husband John Bayley, from the romance of their early days at Oxford in the 1950s to her tragic death with Alzheimer's disease in February 1999. 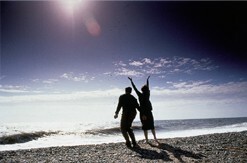 The film is based on the memoir, 'Elegy for Iris' by John Bayley. 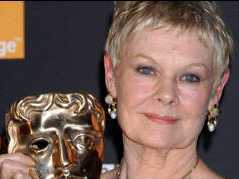 Patrick's comments: Jim, who shaved his head for the role, plays Iris's husband, John Bayley, opposite Judi Dench. The film covers two distinct periods of her life. The young Iris and John are played by Kate Winslet and Hugh Bonneville. This is a truly moving story but the film's strength is undoubtedly due to the casting and the gripping performances by the four leads. Jim completed filming in Oxford and at Pinewood Studios in Spring 2001. Awards: The Oscars: Jim has won the Academy Award for Best Actor in a Supporting Role for his portrayal of John Bayley beating fellow English colleagues Sir Ian McKellen and Ben Kingsley. "Stone the crows!" exclaimed the elated actor, "Making Iris was the most joyful and wonderful experience". "Stone the Crows! I'd like to thank the Academy for this wonderful honour. Making Iris was the most joyful, wonderful experience and for that much thanks to Intermedia, to BBC Films and to Miramax for getting behind it and putting it out. And above all to Richard Eyre for writing a wonderful script with Charles Wood, for directing with skill, intelligence, humour and great talent and for putting together a wonderful cast for us to work with. 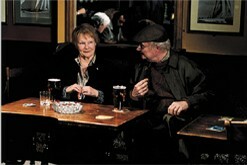 With Hugh Bonneville as the younger me and Kate Winslet and the special Judi Dench who I had a lot to do with. And I'd like to thank John Bayley who allowed us to plunder and, I'm sure, misrepresent his life with Iris and above all I'd like to thank my wife Anastasia for coming with me on this long and rather unpredictable journey. Good luck Moulin Rouge!" Awards: Golden Globes: Jim Broadbent was the toast of the British film world in the early hours (UK time) of Monday 21st January after scooping a top Hollywood award for his role in the movie Iris. Broadbent was honoured by the Hollywood Foreign Press Association with a Golden Globe for Best Actor in a Supporting Role. Accepting his award after beating competition from actors including Jude Law, Ben Kingsley and Steve Buscemi, Broadbent said: "This is amazing, I couldn't be more surprised, I've not got anything worked out." Before the awards he said: "I'm overwhelmed, I'm trembling. There's Jon Voight and James Coburn, all my heroes. I might pass out." At a star-studded bash at the Beverly Hilton Hotel in Beverly Hills, Los Angeles, he paid tribute to fellow Britons Dame Judi and to Kate Winslet, who played the young Iris. Golden Globe - The Acceptance Speech: This is amazing, I couldn't be more surprised, and I really haven't got anything worked out. But I'd just like to thank the producers, the director, the writers, the fellow cast, particularly Judi Dench who I had so many scenes with and who made it so easy. Kate Winslet who made the film so wonderful even though I didn't actually act with her. But, um, Hugh Bonneville who played the younger me, which is quite a task, but - I think this reflects on him as well, because it's the whole part. And most of all I'd like to thank Richard Eyre, the director who co-wrote it and cast me in it. He's a brilliant, wonderful director and friend. And I'd like to thank my wife Anastasia who is here to support me tonight. And thank you to the Golden Globes organization. Thank you. The BAFTAs: Jim received a BAFTA nomination for Best Actor for his role as John Bailey. (The award went to Russell Crowe for A Beautiful Mind), Kate Winslet was nominated for Best Supporting Actress (won by Jennifer Connelly for A Beautiful Mind) and Hugh Bonneville was nominated for Best Supporting Actor (won by Jim Broadbent for Moulin Rouge). Iris was also nominated for the Alexander Korda award for the outstanding British film of the year (won by Gosford Park). On a more positive note for Iris, I am delighted to report that the wonderfully talented Dame Judi Dench received the BAFTA Best Actress Award for her role as Iris Murdoch (pictured right). She said of the event, "I was very shaky on stage. I made a million pound bet with my agent five minutes before that I wouldn't win so I was very shocked. I was very shaken - if you lose a million pounds five minutes before, it is very shaky." The BAFTA awards were presented at the Odeon Cinema in London's Leicester Square on a very wet Sunday 24th February. The event was superbly hosted by the delightfully witty Stephen Fry. 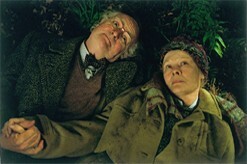 More Awards: The 2001 National Board of Review has honoured IRIS with a Special Mention for Excellence in Film-making. 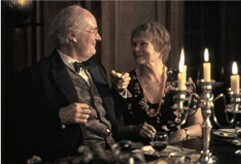 It has also awarded Jim Broadbent with Best Supporting Actor for his roles in both Iris and Moulin Rouge. The Los Angeles Film Critics Association has followed suit and awarded Jim with Best Supporting Actor for his roles in Iris and Moulin Rouge. Jim says: "I like character acting challenges so I took it on. It's a lovely, lovely script. Just beautiful and very carefully written, and extremely accurate in terms of the history that John Bayley has written about their lives. The fact that I'm playing a real person makes my job much more complex. The extensive contradictions that one builds up in a long lifetime will always be more than in a fictional character who is drawn in broader strokes. Creating this sort of fuller character is very exciting for me." "I think John was in total awe of her his entire life. He's totally in love with her with a sort of enduring surprise and passion. The excitement of just being in her presence, and how that balance changes for him after her illness sets in, shows how their relationship remains equally strong if not stronger." Première 2: IRIS UK Première in London at the Curzon Cinema in Mayfair on January 13th 2002. The event was attended by Jim and his wife Anastasia along with the rest of the cast. John Bayley was also there. Here are a selection of photographs from the event.